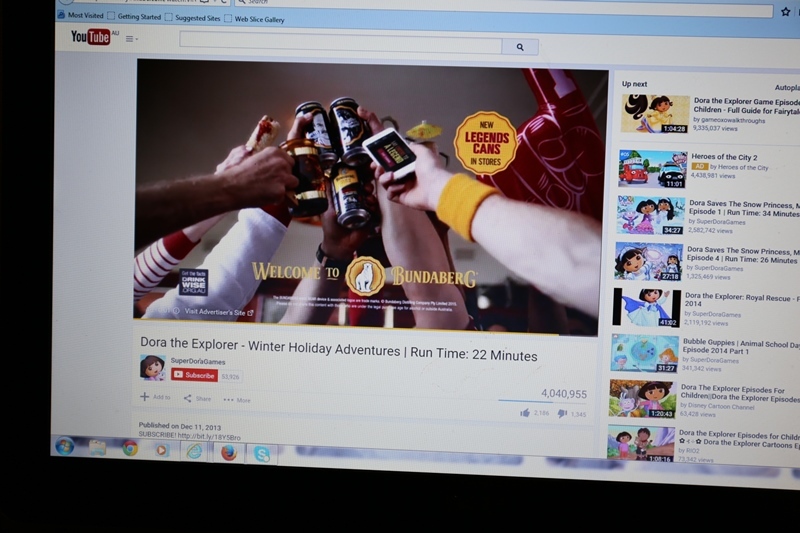 In an earlier post I showed photos of an Australian alcohol company, Diageo Australia, spamming my 3 year old daughter with an advertisement for Bundaberg Rum when she clicked on a YouTube video of Dora the Explorer. I saw this as an important public interest issue, so I decided to follow it up. Here’s what’s happened since. Google (which owns YouTube) has been grappling with technical difficulties about the placement of inappropriate ads next to children’s content hosted on YouTube. Until resolved, this practice creates bad PR for everyone. It makes alcohol companies look desperate and mercenary. And if you own the IP for Dora the Explorer or, say, Frozen, would you want alcohol companies messing with your child audiences? The practice comes as no surprise to ABAC. ABAC is the voluntary, alcohol advertising code and complaints scheme whose Management Committee represents Australia’s beer, wine, spirits and advertising industries. The Australian government is also represented on the Committee, through the Head of the Department of Health’s Drug Strategy Branch. 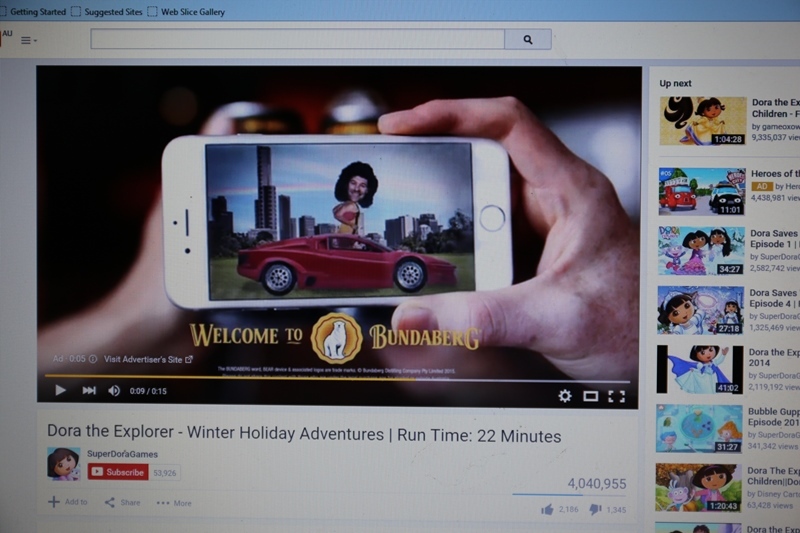 In 2012, the ABAC Complaints Panel dismissed a complaint (118/11, 14 January 2012) about an alcohol ad placed prior to a children’s game on a children’s website aimed at 3-8 year olds. On that occasion, the Complaints Panel wrote that “the Panel is only permitted to consider whether the content (not the placement) of the advertisement breaches the ABAC”. Why is ABAC ignoring my complaint? I wanted to confirm what kind of advertising the ABAC Code prevents, and what it allows. So on 29 September 2015, I sent a complaint about Diageo’s Bundaberg Rum ad to ABAC, through the Advertising Standards Bureau portal. On 1 October, the ASA forwarded it to the ABAC Complaints Adjudication Panel. Under ABAC’s Rules and Procedures, the ABAC Management Committee has set a target of 30 days (1 month) for handling complaints. It’s now 11 weeks since the complaint was referred to the Complaints Adjudication Panel. The Panel is yet to acknowledge receipt. It’s not a good look. In the meantime, ABAC has published adjudications for complaints that were made more recently than mine. According to ABAC, ABAC is the “centrepiece of Australia’s quasi-regulatory scheme for alcohol advertising”. Former Senator the Hon Alan Ferguson was appointed the inaugural Chair of ABAC’s Management Committee in July 2015. The Chief Adjudicator of the Complaints Panel is Professor Michael Lavarch AO, a former Commonwealth Attorney-General. The Hon. Sussan Ley MP, the Minister for Health, did respond to my letter raising the issue of alcohol spam to children watching age-appropriate content online. She advised that the Department referred my letter to the ABAC Management Committee for consideration at their meeting on 24 November 2015. Minister Ley also advised that in consultation with ABAC the Department will “undertake further discussions with [the] internet industry associations about this issue”. The Department’s involvement in this issue is timely and welcome. Minister Ley referred me to the recently-released report of the (now disbanded) Australian National Preventive Health Agency entitled: Alcohol Advertising: the Effectiveness of Current Regulatory Codes in Addressing Community Concern (February 2014). This report concluded that current regulatory arrangements “on the placement of alcohol advertising are failing to sufficiently protect children and adolescents and in some cases are facilitating their exposure to alcohol advertising” [particularly when watching live sporting broadcasts on weekends and public holidays (pp 9, 99-100)]. This report called for a review of all aspects of alcohol advertising regulation during 2016. Amongst other recommendations, it called for changes to the ABAC Code to ensure that it covers alcohol advertising in all media, including user-generated online content (such as YouTobe) (pp 119-121). It called on ABAC to perform annual monitoring of alcohol marketing, with public reporting (122-123). I also received a reply on behalf of Senator the Hon. Mitch Fifield MP, the Minister for Communications, who confirmed that the Department urgently sought comment and action about the Diageo ad from Google. Google advised the Department that none of these measures were effective in this case. At the time I made a complaint to the ABAC Panel, I sent the same complaint to the Alcohol Advertising Review Board. The AARB is is an initiative of the McCusker Centre for Action on Alcohol and Youth and Cancer Council WA. It administers an alcohol advertising content code as well as a placement code. Earlier, Diageo told Fairfax journalist Amy Corderoy that the company “has very strict and long-standing guidelines and policies to ensure that our products are only advertised or promoted to people aged 18 and over” and that the company would investigate. The AARB found that by streaming its ad with children’s content on YouTube, Diageo was in breach of the provision above. You can read the AARB’s determination here. The business of encouraging people to purchase lots of alcohol is the alcohol industry’s business. If they want to engage in that business, they ought to give children’s content a wide berth. I don’t yet see any evidence that alcohol companies have fixed the problem or that they are willing to be held accountable for their ethical obligation to keep away from kids’ play areas. ABAC should respond to my complaint, or explain why it is incapable of doing so. On my reading, the ABAC Code doesn’t prevent alcohol companies from spamming kids with liquor ads online, provided those ads do not breach other Code provisions. If the ABAC Code is to maintain credibility and public trust, this gap must be urgently addressed. As a forum dominated by industry associations with a natural bias towards alcohol advertising, ABAC’s Management Committee may not be the best forum for addressing long-standing gaps in advertising regulation. Spamming kids with liquor ads is a public interest issue, and the public should be kept informed about how industry and the government are going to ensure this practice ceases. Are you interested in studying about health law and regulation? Sydney Law School offers a Master of Health Law with units of study that explore health care law, public health law, mental health law, and global health law and governance. Click here and here for more information. ← Santa: jolly gift giver, or creeping trespasser?